In Norwegian mythology, dragons are guardians of sacred places and precious goods. Dragons incised on this cabinet’s door protected a church organist’s treasure—her printed music. Music was an important community-builder in Norwegian-American settlements; Kristine Goli played in Perry Lutheran Church for a remarkable 69 years. 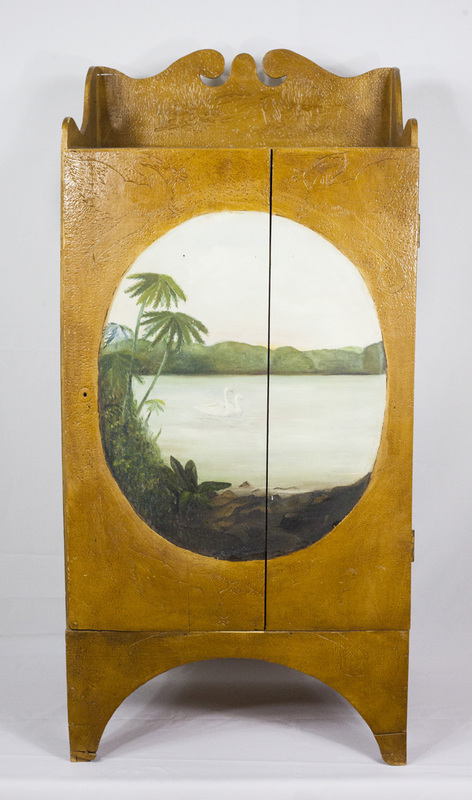 Three members of the Goli family contributed to the creation of this cabinet. Kristine’s father, Erick Goli, was the cabinetmaker. Her sister Margrethe added the incised dragon and chrysanthemum details. Kristine’s sister-in-law, Amanda Goli, painted the lake scene typical of the Arts and Crafts Movement. Finally, an over-painting of yellow paint and stain was applied to the entire cabinet, presumably to accentuate the detailed incising.